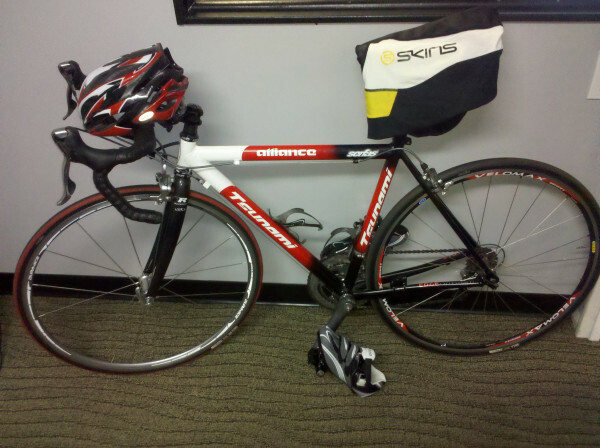 Great picture of the road bike Doug Katona built for me for the Fearless Races Sprint Triathlon. The race is October 30th in San Diego at Fiesta Island. It will consist of a 375m swim, 10k bike, & 2.5k run x 2! Yes, its 2 rounds. Thats the fun part right? The 2nd swim will be interesting. Why do this? Right? Well, why not is my answer really. I mean its short. These are components of fitness that need to be tested and for me, IMPROVED! At the Games this past year I suffered through the swim, soft sand run both times, and even the pull ups, push ups, & squats. So basically the whole thing. Why though? I know how to swim, I’ve improved my running, and I am pretty good at Angie (100 pull ups, 100 push ups, 100 sit ups, 100 squats)I think there is a lot to it but mainly being comfortable with longer distance stuff. I have been working pretty closely with Brian Mackenzie of Crossfit Endurance on this exact thing and have seen some remarkable gains! Efficiency is the key. If you can go fast and basically never breakdown you will KILL IT! So I have been working on my runs and I am making huge gains, I have dabbled in a bit of swimming and getting a lot better. Recently I have been hitting the bike to build up my “pain threshold” as Bmack and Doug would say. Adding these 3 movements into my weekly programming has been a challenge. I am running, cycling, and swimming twice a week but holding off from doing 3 a days. Meaning I hit 1 WOD (main site) and 1 endurance effort a day. Plus my heavy lifting (westside method) twice a week and my extra gymnastics skill work. I also program a Strongman WOD every Friday to make sure I am continuing to build strength in the midst of all of this Endurance training. I definitely have a full plate for now. This won’t last much longer though. Because of this I am focusing a lot on the recovery side. I go in the ice bath regularly, I do extra SMR (self-myofascial release) and mobility, and I have been wearing my Skins recovery pants and long sleeve top after my workouts and while I sleep. As well as my POST WORKOUT shake and 7+grams of Fish Oil (EPA/DHA) from Stronger Faster Healthier. Recovery is the key. Getting on the bike at Doug’s house I was a bit timid and unsure. I have never used Clip in Shoes. I picked up some Shimano’s from the local cycling store along with some cleats. Who knew cycling required so many purchases? This is a super nice bike and extremely lightweight. Doug reassured me that I will be fine and won’t fall over. I don’t know if that was true or just hoping I don’t destroy his bike but either way I believed him and put my shoes on and jumped on. It wasn’t bad. He had me ride down the street and get a feel for the bike. It took me back to the days of being a kid. I don’t know about you but when I wanted to go somewhere or hang with friends we were outside riding our bikes. We didn’t have gears just a generic schwinn or bmx bike. We rode those things everywhere and for miles. I don’t remember ever getting tired or sore. I loved riding my bike and have so many fond memories of riding bikes. Riding around the block with Doug was such a treat and this bike was FAST! The wind in your face the ease with which you can cruise around. I don’t know why more people don’t do this more often or why I haven’t been on a bike in so long. This is an exciting time for me. I am looking forward to the Mini Triathlon at the end of the month. Its going to be very challenging for me but I plan on crushing it and surprising myself. I will be doing some transitions from bike to run and run to bike to make sure I am comfortable doing so in the race as to not waste much time during the transitions. I have a few more swims, runs, and rides before the big race but I am ready mentally. This isn’t for fun, although it will be a fun experience. This is to fill some holes in my game and fitness. Bring it! Remember…EVERYTHING COUNTS.